The 1841 British America map was especially interesting to me as an American, but each ot these maps offers a fascinating look at North American exploration and conflicting claims through the centuries. Most are new to me, too, so thanks for posting this rich collection of maps showing the evolution of Canada! Where do you find the maps? Online or elsewhere? Interesting. I love looking at old maps! I have always found maps fascinating. Thanks. Your photos whizzed me back to a small country school in Saskatchewan, where the teacher rolled down the maps rather like window blinds. Those old school room maps were terrific! I recall them in some of our classes in grade school as well. Good old times! Vancouver in the map is such a rugged terrain. It’s interesting how names have changed on the maps. The evolution of place names is sometimes fascinating! You’re right, old maps are art as well as science — and the older they are, the more art that is involved. Perhaps because the cartographers had to rely on imagination to fill out the page? Even the positioning of the geographic units on the page tells a story. I remember amazement at my first sight of an Indonesian map of the world: it put Indonesia (etc) dead centre, with Europe and North America wriggling apologetically down each side. It seemed all wrong, until I stopped to think that our own, Americas-to-the-centre, version is equally arbitrary & self-interested. Penny, you’re spot on with these observations! Those are some of others ways that maps and their makers reveal the stories they are telling (consciously or otherwise). I love looking at old maps. The illustrations with animals and sights. The lone houses on the squares of the cities that have been divided into grids. I find old maps tells the history more truthfully. Loved your write up. Lovely! I have a few books about old and ancient maps. An interesting book is ‘The island of lost maps’ subtitle ‘A true story of cartographic crime’ – about a clever cartomaniac thief who stole ancient maps from libraries under the eyes of curators. Recommended. Maps make me feel right at home for some reason, and I can study them for hours. I have a giant map of both the U.S. and the World on the wall behind my desk and find my eyes wandering over them very often…when I should be doing other things! You posted a beautiful selection here. Elisa, I’m with you! Maps are wonderful diversions! Ooooo, I adore old maps – there’s just something about – if only they could talk – thank you for sharing! Maps are always wonderful but I particularly liked the Vancouver city map. It seems to be of a style that’s completely faded, the realistic but non-overhead view of a city. Directly overhead and realistic, or from an attractive angle but cartoonish and exaggerating local landmarks are the more common things and that’s fine enough, but, the thing that looks like what a snapshot from an airplane might have pictured seems to have gone. So true — the Vancouver map is distinctive and of a bygone era! I am always amazed by maps before there were airplanes! But I don’t know anything about cartography, so maybe it was really easy. It is the accuracy before our technology that fascinates me, I guess. So thank you for this beautiful representation of Canada through maps! 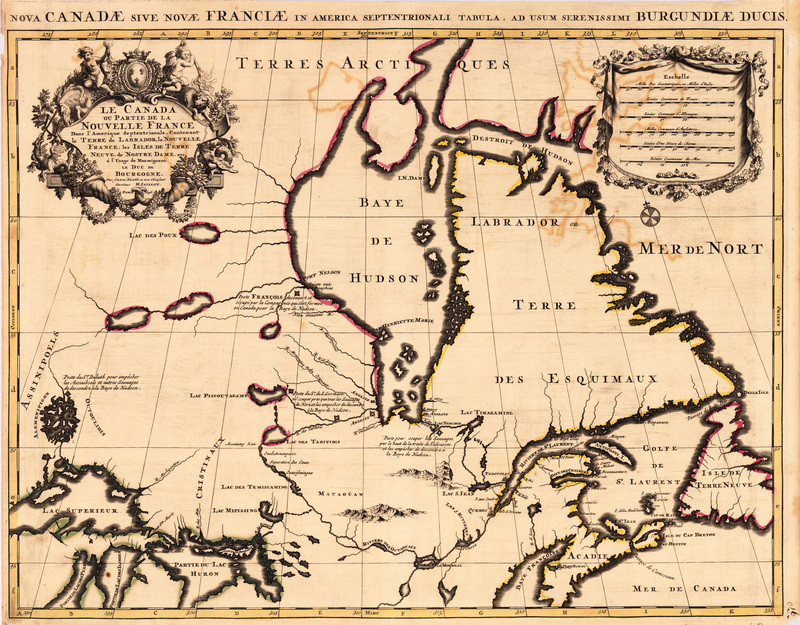 I am particularly interested in the 1760 map of the Gulf of St. Lawrence, for some reason…. I agree that it’s fascinating how early map makers were able to be so accurate (under the circumstances) without the use of modern equipment. The Gulf of St. Lawrence map is pretty interesting! More great information, thank you. Is it possible to use one of your maps to illustrate one chapter of a book we are preparing on the St Lawrence Gulf? Thanks for your message. If it were up to me I’d say yes, certainly. Many of the images on the site are mine, but in this case, the maps posted here are images from elsewhere and you’ve have to check with the copyright holders on that to be safe. If I can guide you in any way, though, let me know.